I’ve needed new jeans for a while. Like, a really long while. 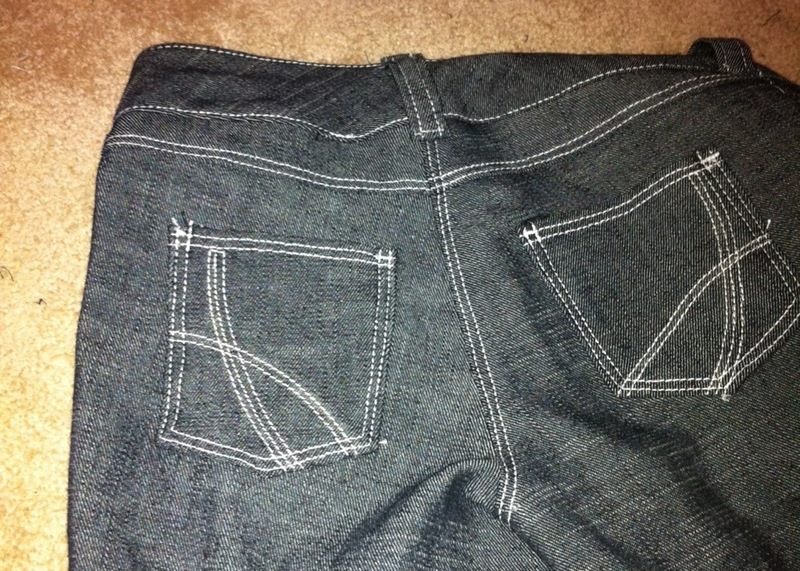 The last pair was these skinnies, a year and a half ago. Which, I’ll add, wound up twisting annoyingly in the one leg, so I don’t wear them much. I think I definitely need to embrace the single-layer cutting for jeans. /sigh. I used this polkadot (? 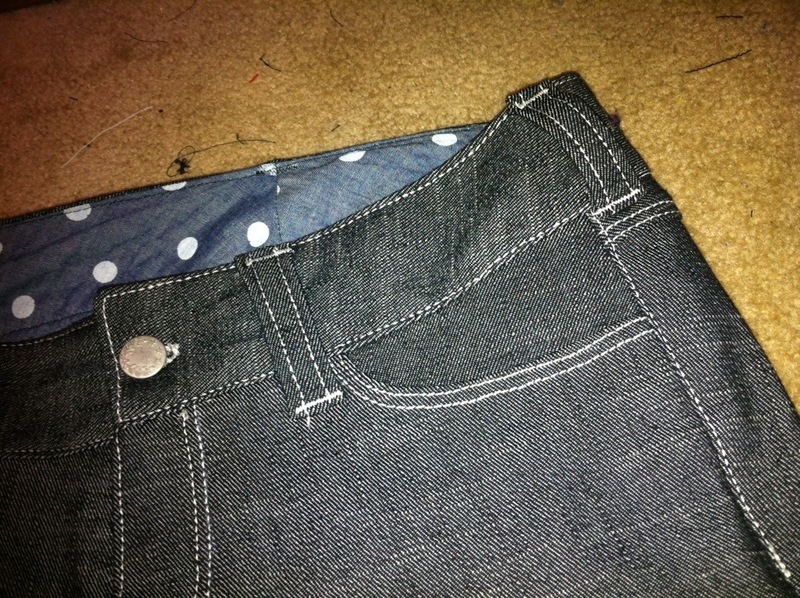 )chambray for the pocket lining and inside waistband. It’s nice, but a bit lighter than I’d like for this purpose, I think, even interfaced. The waistband is fairly wide, and it ended up being a bit floppy, even with my adding a CB seam so the front could be on the grain. Also, I should’ve added two buttons for the width, not just the one. Hopefully we’ll get around to the rivets sooner rather than later. I did not put a whole lot of work or thought into the pocket design. Just something simple I could copy fairly easily. I was busy overseeing Stylish’s pair. Oh, yeah, and I’ve recently discovered the one up-side of having a child large enough to steal your clothes. You can steal hers back. And, while I normally wouldn’t show this much tummy these days (never mind on the internet), Osiris’s reaction to this ensemble was, shall we say, sufficiently positive that I’m gonna put it out there anyway. Pretty jeans! You rock in them, the color suits you very much. I love your contrasting stitches too. Love it! I am not surprised to hear that Osiris was pleased with your outfit. Not at all. 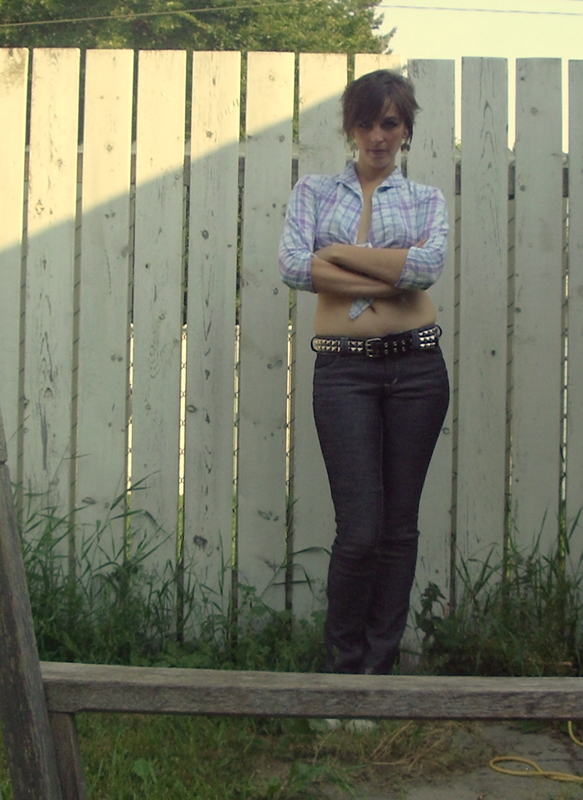 Wear with pride: they aint no MOM jeans! Great job on the jeans! And I love the little splash of polka dots on the inside. Gorgeous, love your jeans. Very flattering on you, as well. Definitely the jeans queen. These are fantastic. 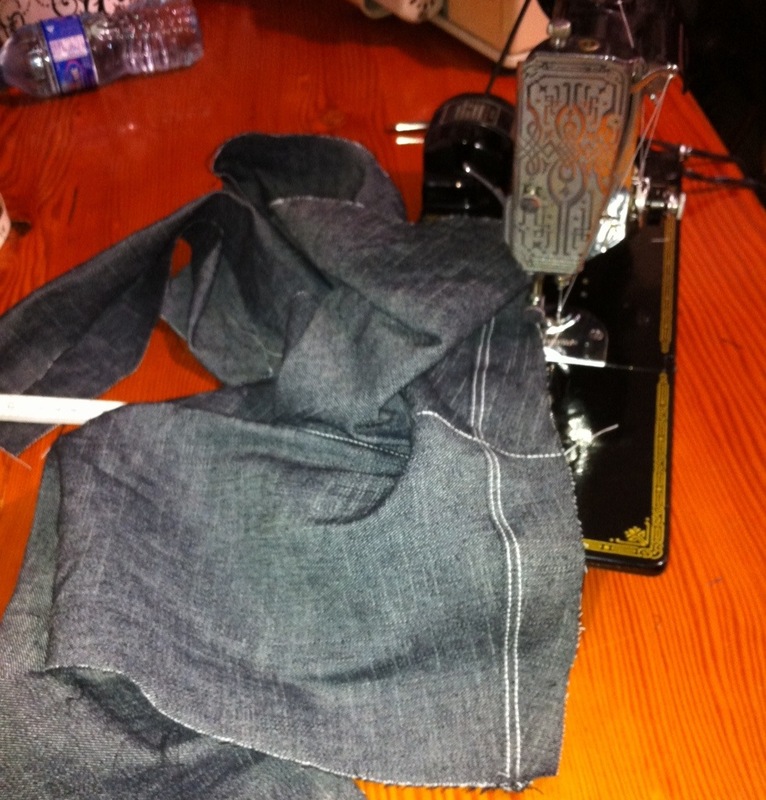 I’m so impressed by anyone who makes their own jeans, especially when they’re this good. Also, your husband has excellent taste.